Synchronize multiple Outlook folders, including public folders and subfolders. Carry business and personal information anywhere. Select any public folders and any subfolders to sync with your handheld. Each Outlook folder on your PC becomes a category on the handheld. Palm OS software allows up to 15 categories per application, so you can synchronize up to 15 public folders or subfolders. Change default folders: Treat your preferred folders as the default folders, so you automatically synchronize your most important information with your handheld every time. Multiple PCs: Synchronize your handheld with multiple PCs connected to the same Exchange server. Multiple calendars - FREE Chapura Calendar application lets you keep multiple peoples calendars in one application on your handheld. 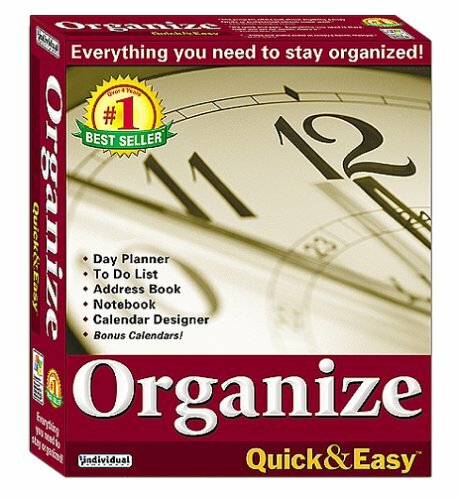 Synchronize and sort by calendar category. Easy to use: Simple and quick one-button synchronization helps keep information accurate and updated. I installed the trial version, downloaded from the franklincovey website.It crashed twice during install, and now MS Outlook takes several minutes (yes MINUTES) to launch.I tried to uninstall this piece of crap, but it will not uninstall. Do not pay money for this product! I have never written a review of a software product before. 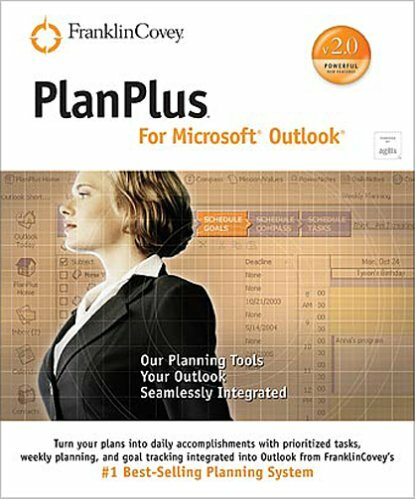 I felt compelled to write one about FranklinCovey's PlanPlus For Microsoft Outlook 2.0 because I hope to that it will dissuade people from wasting money on this product. Until I bought this product, I had no beef with the company FranklinCovey. I have been using their paper planner for the last 6 years. I had hoped that PlanPlus would simplify my life by allowing me to use planning tools while in Outlook. In reality, I have had nothing but trouble with the nearly impossible installation, the buggy product, and the infuriating tech support. It started when I tried to install the product on my laptop. I worked with their tech support online (they charge if you want to actually speak with someone). I went through quite a few tech support people, many of whom seemed to repeat the same mantra of "uninstall/reinstall" which I did countless times. I really had to push them to get them to help me. When they were stumped and they said they would research the issue and get back to me and of course they never did. EventuallyI got someone online and I would not let them go until we resolved the installation problem. After 5 days of working at this, it was finally installed. To my horror, it slowed down outlook so significantly that I decided to uninstall it. Around the same time I was dealing with problems with the install on my laptop, I was trying to also install this on my desktop PC. I worked with tech support for about 3 weeks off and on. Again, they were stumped. They kept repeating the phrase, "We will get back to you at the earliest." I never heard back from them. Now I wonder what they meant. Was it the earliest ice age? The earliest millenium? They kind of left it open for interpretation. It's been several months now and I have wasted so much time on this. I was never able to install the product, I kept getting an error message and the installation would stop. I can't return the product because they don't accept returns on software if it has been opened. All I can do at this point is vow never to buy another FranklinCovey product again and encourage others to reconsider their plans to purchase this product. If you are a diehard Franklin Planner user, like I was, I would recommend that you stick with the paper planner - it's far less buggy and you won't have to deal with an indifferent tech support that will "get back to you at the earliest." I wouldn't risk it based on the reviews here. The first version ruined my Exchange profile - now I can't have tasks in Outlook -EVER. FC Support is worthless. So ironic that a company that puts so much emphasis on integrity and excellence put out such an incredibly shoddy product. I'm sorry - I can't trust a company that would release such an incredibly bad product. I'd wait to buy this until they come out with version five or so. By then, the bugs might be gone. As it is now, I'm using Outlook 2002 on a Windows XP 3ghz machine with 1gb of RAM, and it takes me 34 seconds to load Outlook (time for the splash screen to go away). Occasionally it will tell me it had to disable PlanPlus on startup as well. The memory usage (if you leave it open all the time like I do) is high as well, although I don't notice it much, having such a leet box (translation: fast computer). I do give them 2 stars instead of 1 because it's pretty. I decided to use it based on screenshots alone. Outlook 2002 on its own is really dull, especially after you've looked at it daily for years. The extras (like the Compass, Mission/Values, and Goals) are very similar to their planner kits' first few pages. So if you liked those, I'm sure you'll enjoy the extras on PlanPlus. I am running PlanPlus on a 10 month old Gateway 450 laptop. XP is my operating system. Accordingly, I think my computer, while not brand new, ought to be able to accomodate the general office tasks I ask it to perform. More fields: Synchronize key details stored on your desktop with your handheld, including all 19 phone numbers, all 3 email addresses, all 3 street addresses and more! Any folders: Find and update information wherever you are. Outlook folders become handheld folders, not categories. Including public folders and subfolders. Multiple categories: Keep categories consistent between both places to quickly organize, sort and find information on your handhled. Use over 250 categories per handheld folder and multiple categories per item. Multiple PC's: Synchronizing multiple PCs (like your office and home PCs) with KeySuite helps you keep business and personal information together on the handheld but neatly organized in separate folders. 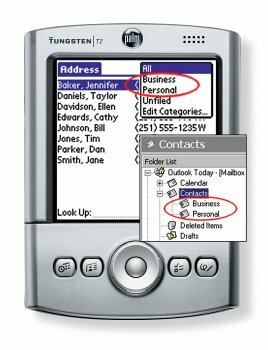 Easy to use: KeySuite software combines the comprehesiveness of Outlook with the uncluttered, intuitive interface of the Palm OS. Access data with minimal taps. Use of navigator and tap dialing is simple. Being a user of ACT since 1990, I thought I would continue to upgrade as I have in the past. What a mistake. 6.0 (was no IS) a good product.2005 has a long way to go. I would like everyone to know when you transfer your 6.0 database to 2005 there is no way to revert back to 6.0 and bring your notes with. I just installed ACT! 2005 after using previous versions of ACT for 10 years.I was very disappointed.My custom layouts were not imported, system ran slow (hard drive ran for a very long time) and there just did not seem to be anything new or innovative.I don't think this version is a step up or sideways, but in fact a step down. 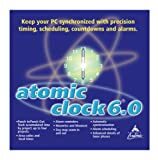 I think users on ACT 6.0 should stay on it.I have read other reviews and found nobody who thinks it works well. Best software needs to go back to the drawing board, start with version 6.0 (which is very good) and only upgrade when they have something new and better. 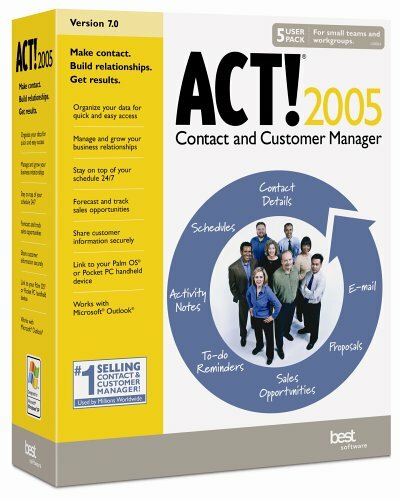 I am an avid fan and user of ACT! 6.0. 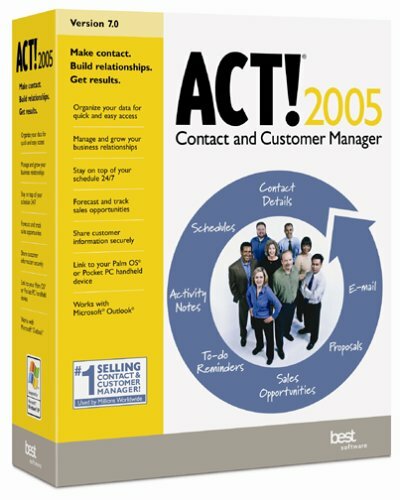 My database is integrated with ACT! for Palm and WinFax Pro and worked nicely since June 2003. Then, I upgraded to ACT! 2005. First, the software simply ran like it was on a 4 year old system with 64 megs of ram. Luckily, Best Software provided an update the 2nd week of Feb. Then, my ACT! for Palm stopped working. Best Software promises that fix is on its way. But, the real kicker was the refusal by both Symantec and Best Software to provide some solution for WinFax's inability to integrate with ACT! 2005. I contacted ACT! first and was told that because Microsoft is updating to the Longhorn OS, Best Software had to stop integrating with WinFax Pro. Right. They then sugested I call Symantec and ask if they planned to offer an upgraded link to ACT! 2005. After speaking with 2 represenatives who's names I can not spelll nor pronounce, I was directed to call ACT!. I explained I had already called ACT! and she assurred me it was Symantec's division that dealt with ACT!. She lied. The third represenative told me to revert back to ACT! 6.0 and at that point I asked for a refund. WinFax Pro advertises its product as an integration solution for ACT!. I was then handed to a fourth person who said they would call back in 2 days. Right. The real hardship of this situation is now ACT! 2005 only integrates with Faxrush (...). Or, you can continue using WinFax Pro by purchasing an additional piece of software from yet another company (...) which will integrate ACT! 2005 with WinFax Pro. I will be doing the same as the above reviewer and adding this to my 2005 tax write off and looking into Microsoft's contact manager. I wrote an earlier lukeware review of this product, but after using this now for a month, I'm growing so dissillusioned with this software I'm inclined to uninstall it and write it off as a loss. 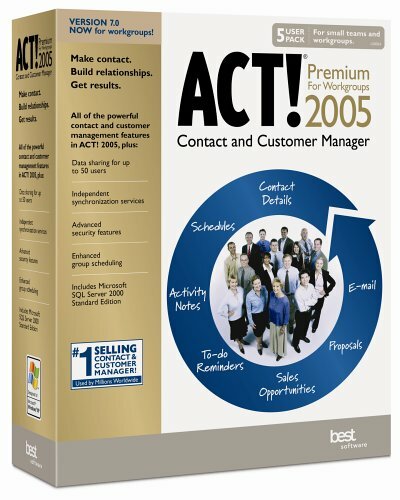 I've used ACT in various versions since it first came out. I still have ACT 3 which I'm thinking of trying to see if it runs on WinXP because it was tons more stable and less buggy than this release. In fact, as far as I can see there has been little by way of feature enhancement between the two, so all this company has done is introduce massive amounts of bugs into the software. There are too many examples to list but here's one that really annoys me. When I import a text file with my contact names into this product, by default the program puts a country code of +256 in front of every number, which is the country code of Uganda! You won't see this though until you sync the database to a handheld device. I use a PocketPC phone. When I open a contact on the phone, low and behold every number starts with Country Code +256! So, to fix the problem, you need to go back through each and every record in ACT and specifically define it as US Country +1, now how fun is that??? Another littel gem happens when you use the product in conjunction with Outlook, which the company says is its strong point. Hmmm. Here's what happens. Lets say you use Outlook calendaring to schedule internal or external meetings. It works great. But, at the same time, you want to use ACT calendar to schedule tasks, to-dos an make note of the fact that you have a meeting or call scheduled with one of your contacts. You do this to keep a record in the history database. Now, when you sync, ACT is too stupid to simply merge the two meeting types onto your handheld or into Outlook - no, it completely wipes out your outlook calendar, replacing it which your ACT calendar. So you have to choose between using one calendar vs antother. Seems to me they should give me an option to merge the two together. I could go on, the list of bugs is almost endless but you get the point. I've ordered an upgrade to Office that includes Contacts Manager. I'll check it out and if it works better - I will indeed remove this program from my machine, write off the expense from my taxes and forget about it! It's a great program with a lot of flexibility but it overtaxes the CPU.After loading the program, try CTRL-ALT-DEL. You'll find it's utilizing most of the CPU.It overheats the CPU if you have more than a program or two running. When I use the program, I have to load it, look up or do what I want and then close it or I get warning messages about the CPU overheating. 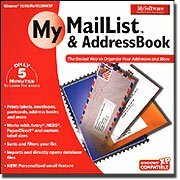 Having used sequential versions of MyDeluxeMailList & Address Book over more than ten years, I continue to use it, but not without misgivings. The bulk-mail presort feature is essential and few other affordable software options exist. Despite excellent reviews, My Software fails to live up to many of their product claims. 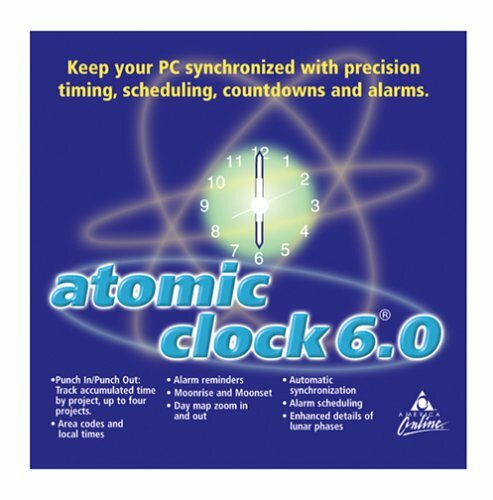 I've installed version 6.000 on two computers, XP and Win98 platforms. The "Quick Zip+4 Lookup" Key Feature doesn't work. On the packaging is a statement "If you have purchased this CD within the last 90 cays call for a free update" (to the address database USPS yearly update). The caller is given no option to request this update when calling that number. Nor is there any option available on the website for requesting this update, or even sending a message to technical support about it. Test every function you need when you install this product and if those functions don't work, return the product immediately. Outlook version 2002 makes working with e-mail, tasks, contacts, and appointments more intuitive without requiring users to learn new ways of accomplishing their tasks or spend time searching for the right tools. A variety of security enhancements have been included in Outlook version 2002 to help users feel more secure when working with e-mail. Setup and configuration have been made simpler with such enhancements as single-integrated e-mail mode, customization enhancements in the Custom Installation Wizard, and a simplified interface for setting up e-mail accounts. New features include AutoComplete Addressing: As a user enters an e-mail address, Outlook automatically recognizes it and completes the name based on previously sent e-mail to the recipient. Users can also now access e-mail from their Hotmail accounts (or other Internet mail providers) directly from within Outlook. Users with multiple e-mail accounts can choose on a per-message basis what account to use to send their message. With Word as the default e-mail editor, users can take advantage of the smart tags that are available in Word (including AutoCorrect, paste options, address, name, date, or customizable smart tags). Smart tags are context-sensitive buttons that give users the options and information they need at the time they need them. Probably the worst program known to mankind. Will destroy your computer. Consistently crashes and renders other programs inoperable. Don't know why Gates isn't in jail for this one. Besides Hotmail support, there really is no difference between Outlook 2000 and Outlook 2002 except for speed.If you already have Outlook 2000, DO NOT UPGRADE!Why?Because it is slower than Outlook 2000 (at least on my machine).In Outlook 2000, I used to be able to click on a message and it would instantly pop up.In Outlook 2003, it takes a good 2-3 seconds.As the saying goes, if it ain't broke, don't fix it. Much Slower than Outlook 2000 an not much different. Wow, this is an upgrade,NOT!! You've got to be kidding me. New features are mostly worthless and it runs much slower than 2000 on my Pentium 1.4 ghz with 512 MB RAM. Not only will you be disappointed, but you will have wasted your money. I enjoy MS Office, but their upgrades are no longer worth paying for. To boot, we now have to activate our product through Microsoft...what a joke! If your new to computing, be smart and look for Office Suite alternatives. 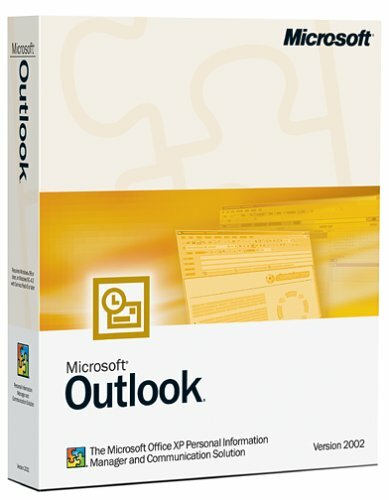 Although you state this is Outlook 2002, I received Outlook 2000 [the box clearly states it is Outlook 2000 -- with an exclamation point after 2000 -- i.e. 2000! ).I have an XP and requested the latest version of Outlook (2002) not 2000.Also, I filled out the form for a rebate and never received it.I have been charged your (then) full price for the item. How can I rate version 2002 when I received 2000 (which I already had)? There are better alternatives out there! When the cost of a technical support phone call costs more than the program, it should tell you something. Lockups, error messages - what is your time worth?Spend a little more for something that works. This software isn't perfect but it certainly served my purposes for getting holiday cards out this year. The database was easy to use. The help menus were good but sometimes did not match what was contained in the pulldown menus. I loved the label and envelope templates but they all omittedthe salutation field (Mr. Ms. etc.) and I had to make my own which tooksome practice and know how. For what I paid for this software it was justfine. Very difficult to use.We tried using this to help us print our Christmas cards but it was unable to do it.It insisted on printing blank fields and didn't let us customize the output at all.A big thumbs down! This is a good program that has aged poorly. 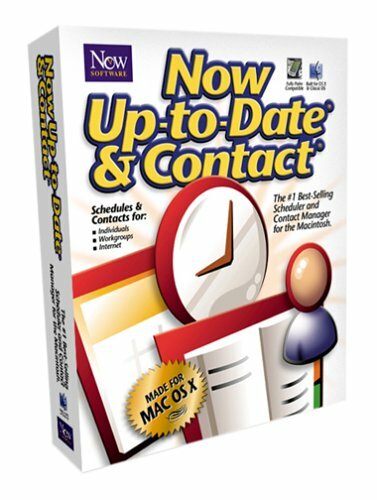 Now Up To Date & Contact (NUTD) is a contact manager and calendering program written for Mac users. First written for Mac OS 9, it was the best choice when there were few options. Windows users had Act! but Mac users did not yet have iCal or Entourage. NUTD is simple enough to start using quickly. It is has a number of options to let you customise the data fields, create your own templates for letters and faxes and it can be net worked with other members of your company or organization. It can be used with Palm devices but NUTD conduits conflict with iCal and Entourage conduits. The NUTD support site lists the other conduits with which it conflits. Because of all the ways you can customise reports, it is a great way to maintain and print an address book or customer list. It is easy to insert a contact`s name and address in the program`s word processor. The word processor is very basic and lacks most of the features a Word user might expect. But it does link the saved document to a contact's file. If you use Word, you will have to link manually. NUTD has templates to print envelopes and labels as well. There is a telephone dialer built into NUTD. Clicking on the telephone icon in a contact's record will dial the number, open a new dialogue box for notes, date and time and when closed, link the data to the contact record. NUTD has not had a major upgrade in years. InMAC OS X it is quirky and unreliable. The servers that allow users to share files crash and corrupt their data base. The NUTD site has extensive help files to show users how to re-install and restore the servers. There is a reason for all those help files, you will be using them. The NUTD support site use to have a user discussion board. Before it was taken down, some users expressed a lot of dissatisfaction. I have lost my calendar server so many times I gave up trying to use it and went with iCal because it is reliable. In using the contact manager, I am frustrated by the programs tendency to generate error messages when making calls or writing letters. Some letters are corrupted when saved. The technical support staff does respond to email inquires within a day or two. However, they can not do anything about the program's limitations. If your data is gone or corrupted, you have to start over. John Wallace, President of NUTD, said in a email (February 2005) that version 5 of the program is in beta testing and should ship in the next couple of months. It would be worth looking at the update. But there is a new player, DayLite by Marketcircle. DayLite seems to have more momentum with frequent updates, enhancements, new add-on programs and even a Yahoo user group. NUTD is in damage control mode and vapor ware - sort of like the Windows ware that drove me to Macs in the first place.